From September 21-30, 2006 the average area of the ozone hole was the largest ever observed, at 10.6 million square miles. This image, from Sept. 24, the Antarctic ozone hole was equal to the record single-day largest area of 11.4 million square miles, reached on Sept. 9, 2000. Satellite instruments monitor the ozone layer, and we use their data to create the images that depict the amount of ozone. The blue and purple colors are where there is the least ozone, and the greens, yellows, and reds are where there is more ozone. 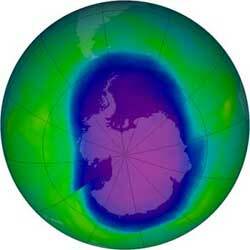 The ozone hole of 2006 is the most severe ozone hole (least amount of ozone) observed to date. NASA's Aura satellite observed a low value of 85 Dobson Units (DU) on Oct. 8 in a region over the East Antarctic ice sheet. Dobson Units are a measure of ozone amounts above a fixed point in the atmosphere. This severe ozone hole resulted from the very high ozone depleting substance levels and the record cold conditions in the Antarctic stratosphere. 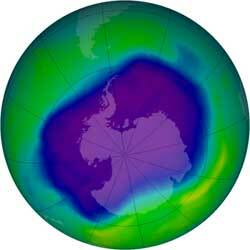 "We now have the largest ozone hole on record for this time of year," said Craig Long of NCEP. As the sun rises higher in the sky during October and November, this unusually large and persistent area may allow much more ultraviolet light than usual to reach Earth's surface in the southern latitudes.